Sitting at the feet of Richard Long. Artists at a GroundWork Gallery Talks event. heartfelt thank you for all the work and love and integrity you put in to your excellent exhibitions. I know the environmental philosophy of the gallery is one with which I strongly concur – you are preaching to the converted here! - but today I felt truly moved and strangely emotional amongst the beautiful work you have selected. GroundWork is an art gallery which shows the work of contemporary artists who care about how we see the world. Exhibitions and creative programmes we explore how art can enable us to respond to the changing environment and imagine how we can shape its future. GroundWork Gallery brings contemporary art about the environment to the historic town of King's Lynn. Over time, you can expect to see all forms of visual arts: from painting to film to sculpture; from curated collections to new works; from internationally-known artists to emerging talents. The gallery is spacious but modest in size (180 square metres in area), arranged over two floors separated by a stairwell where we also show art. Our programmes are outward-looking, and sometimes challenging. However, the gallery is a space for everyone, a space for lifelong residents and first-time visitors, a space to be inspired by art and environment. Events, talks, films, music, practical workshops, and community projects accompany each exhibition to open up its ideas in different ways and to stimulate creativity and discussion. We specialise in talks and discussions by artists and environmentalists together, looking at each theme from different points of view, across art, science and culture. Co Seegers talking about herman de vries. 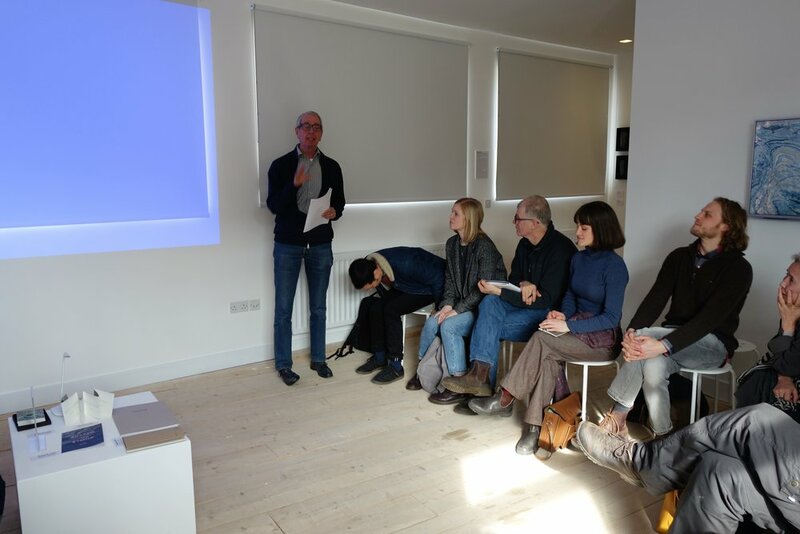 He spends a few weeks every year helping the artist to organise his archive and website and has spent many hours in discussion with him, so we benefited greatly from his experience, knowledge and thoughtfulness. herman is lucky to have him! Events take place in the Living Room upper floor, siting on sofas and stools in an informal atmosphere. Here we have a friendly interval during a gallery discussion event.